Dudley, Massachusetts, is nestled in the rolling, forested hills of southern New England. Students enjoy an active outdoor lifestylethroughout the year, with many local hiking trails, breathtaking vistas, and legendary foliage. Nichols College is just a short shuttle ride from shopping and entertainment in one of five nearby cities, including Boston. 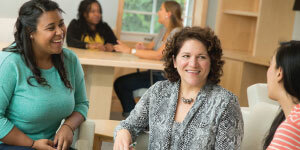 Financial Aid: Merit scholarships are available; 98% of Nichols students receive financial aid. Application Deadlines and Fees: Applications and support materials must be filed by June 25. Use our online application or the United States Common Application. For more information, contact Susan Wayman, Director of the Office for International Engagement, at susan.wayman@nichols.edu. The state-of-the-art Recreation and Athletic Center features a weight room, aerobics room, squash court, and indoor multi-use facility for basketball and volleyball with an elevated running track. Outdoor facilities include the newly revamped Vendetti multipurpose field, an eight-lane running track, tennis courts, basketball courts, a volleyball court, a campus-wide Frisbee golf course, and fields for baseball, softball, and soccer. At Nichols College, we welcome students from all over the world into our community. Our classic New England setting will let you experience rural America through the lens of the business leaders who make it their home. 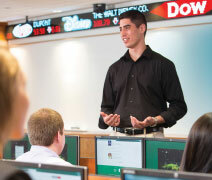 Whether you’re looking to spend four years abroad or get a taste of American business for a single semester, Nichols College will train you in the art and science of leadership in the quiet of central Massachusetts while keeping you connected to the bustle of today’s global economy in high-tech classrooms. International admission applications and supplemental materials must be submitted by June 25. Fill out the Nichols application online and include proof of English proficiency and official secondary school transcripts translated to English.